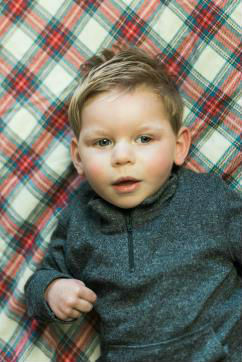 Blake suffers with an undiagnosed neurological disorder that has made these first couple years of his life very challenging. Blake was born on May 4, 2016. He and his twin brother were healthy full-term newborns, with no health complications for either baby. At about one-month-old, Blake had an episode where he became extremely lethargic very rapidly. His parents were greatly concerned and called 911. Blake spent the next week in the hospital where doctors ran just about every test. The findings came back inconclusive and Blake and his family were released to go home. Over the next few months Blake showed various signs that something was just not right. He would arch his back continuously in discomfort, he was very fussy, and would even have moments where he was inconsolable. Blake is being monitored and has been placed in various medical studies. Blake requires the use of a wheelchair and has needed medications throughout this journey. Blake is slowly showing progress, but continues to be very delayed developmentally. This precious little boy has quite the journey ahead of him, but he is proving to be a brave and courageous. He remains a happy little boy, he loves his twin brother, and loves to engage with others. Blake will be adopted as a Sparrow to Grace Christian School. Students at GCS will work hard to raise money for Blake through sponsored community service and fundraising projects.